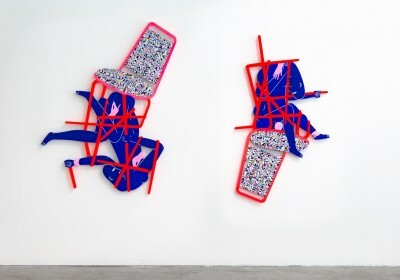 Arsham/Fieg Gallery in New York currently has a show from Mark Whalen on display entitled Grab Bag. The towering stack pieces are examples of the increasing more sculptural work that he has been experimenting with recently. Whalen further explains – “Lately, I have been formulating new relationships with sculptural work. Grab Bag is a new series of multi-dimensional work that presents non-traditional totems representing life’s folly. 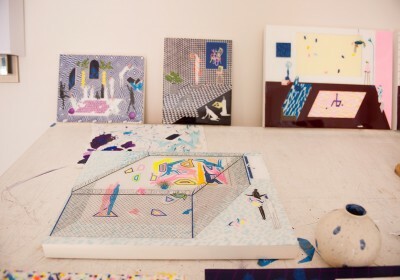 The result is familiar juxtapositions of materials, found objects, and everyday stockpiles.” Discuss Mark Whalen here. 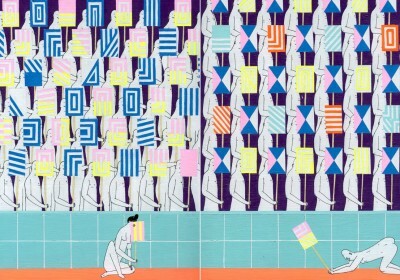 Tonight in Sydney, Mark Whalen (featured) will be opening a new solo show at Chalk Horse entitled Around The Bend. 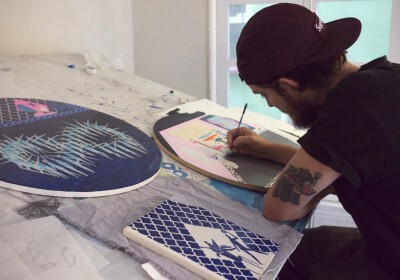 Continuing to refine his technique and evolve his art, the Australian born artist takes his work to the next level with shaped canvases featuring entangled characters and objects. These complement nicely his recognizable resined paintings with related imagery that continue his satirical commentary of modern society. Discuss Mark Whalen here. Over the weekend, the Merry Karnowsky Gallery in Los Angeles showcased work from artists that they will work with in the future with a group show entitled Praeteritum Nunc Futurum. 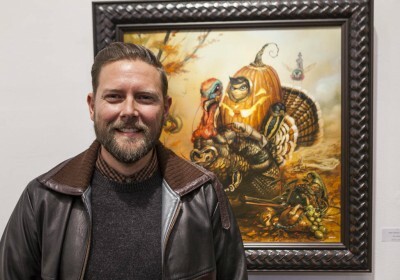 Listed officially were artists like Greg Simkins (seen above), Todd Carpenter, devNgosha, Andrew Hem, KMNDZ, Travis Louie, Nathan Ota, Lezley Saar, Jeff Soto, Nicola Verlato, Edward Walton Wilcox, Mark Whalen, William Wray but pieces from others could be seen as well. Take a look at more photos from the opening reception below… Photo credit: Birdman Photos. Discuss this show here. 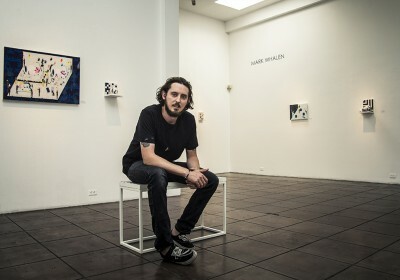 On August 13th, blackartprojects will be showing new work from Mark Whalen (aka Kill Pixie) at the Melbourne Art Fair. 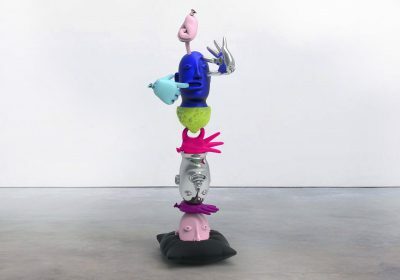 Peculiarities will see the Australian born, Los Angeles based artist continue his explorations of isolated geometric environments where his strange characters dance, contort, and interact in unusual ways, often beautiful and grotesque at the same time. 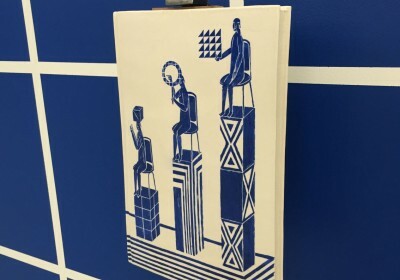 Included in this exhibition are also some works on banners as well as what look to be paintings on ceramic books. Discuss Mark Whalen here. 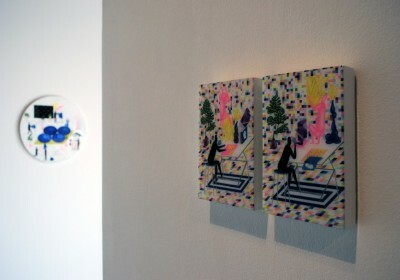 On April 5th, the Merry Karnowsky Gallery will be opening a show from Mark Whalen (as well as from Julian Meagher). 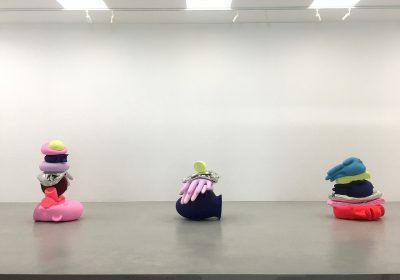 Entitled Stranded, the new body of work from Whalen will include surreal paintings, his catalog of human activity – “playing, fighting, experimenting, creating, cultivating, dreaming, and destroying” – this time within confined interior spaces. Rounding out the exhibition will be a series of ceramic vessels. Discuss Mark Whalen here.